Makes 2 sandwichesThe key to making a good grilled cheese sandwich lies in the heat of the cooking surface. A griddle or well-seasoned cast-iron skillet will produce equally delicious results. Heat a griddle or large cast-iron skillet over medium-low heat. Place two slices of bread on a clean work surface. 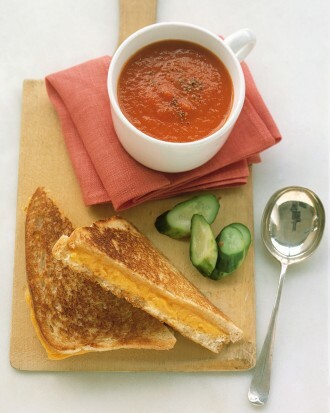 Butter and cover each with a layer of your favorite cheese; some sliced tomato is also appropriate. Grind on fresh black pepper and sprinkle with little salt. Top with remaining bread slices, pressing gently to adhere. Generously butter both sides of each sandwich, spreading it all the way to the edges. Place sandwiches on the griddle or in the skillet. Cook until golden brown on each side and the cheese has completely melted, 3 to 4 minutes per side, turning once. Before removing from griddle, flip sandwiches to reheat first side, about 15 seconds. Cut each sandwich diagonally in half; serve immediately.